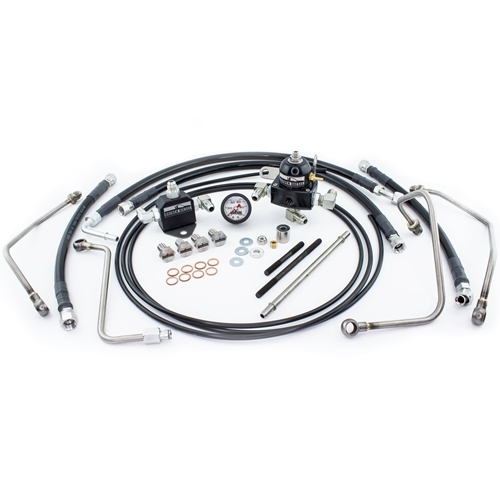 This Driven Diesel RACE Fuel Delivery Kit is designed to work with our FUEL BOWL DELETE Regulated Return Systems to support whatever horsepower you are trying to reach, while still maintaining "Near OE" reliability. We have accomplished this by using two of the Bosch OE fuel pumps from a 7.3L Super Duty. These pumps were specifically designed to pump diesel fuel and have proven time and again that they are capable of running in excess of 100,000 miles without fail. By running two of these pumps in a "side by side" parallel configuration, we have doubled the volume of fuel we are capable of delivering to the engine, allowing us to support large injector upgrades without sacrificing reliability. Dual pumps also provides a level of redundancy for "high performance" trucks that are also asked to do regular duty as the family tow rig or daily driver. Coupled with our new Compact Fuel Pump & Filter Mounting Bracket and either our 5/8" Drawstraw or our new Billet Sump, this kit provides everything you need to feed your hungry 7.3L or 6.0L Powerstroke truck. ** WIRING NOTE : We provide this kit with a single wiring harness, and instructions that will run BOTH fuel pumps 100% of the time. 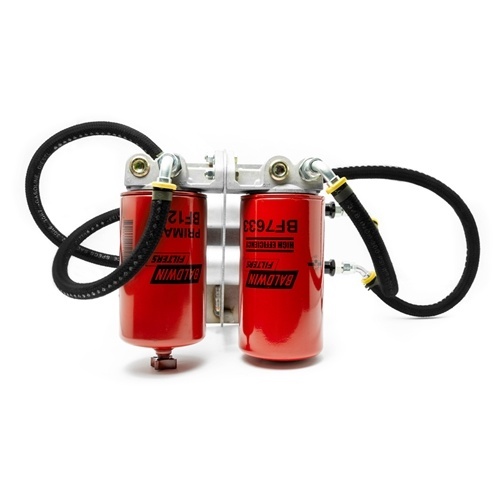 This is NOT the only way to do it, running dual pumps provides a flexibility that you don't get with a single pump setup, you simply need to purchase a second fuel pump harness (see "Related Products" below) to open up the possibilities. With two separate harnesses, you could have complete, independent control of your fuel pumps from inside the cab. With a pair of toggle switches (not included), you could run the truck on a single fuel pump under "normal driving" conditions, easily alternate back and forth between the pumps so you are not always running the same one, and easily enable the second pump only when you are needing the extra volume. This kit was designed to mount INSIDE the frame rail, forward of the stock fuel tank. The fully assembled pump bracket requires about 13-15" of straight frame space to allow for the inlet and outlet hoses to route cleanly. If you have a short wheelbase truck or you have other equipment already mounted in the area forward of the fuel tank, you may want to measure and verify that you have room before ordering, or plan on installing the kit on the OUTSIDE of the frame rail. In these cases, care will need to be taken with regard to the parking brake cable and fuel line routing, and some trucks may require slight dimpling of the underbody to prevent rubbing. All of the pictures in the instructions show a system plumbed for INSIDE the frame mounting. * 99-03 7.3L NOTE : This kit was designed to work with our very popular "7.3L Fuel Bowl Delete" Regulated Return Kit. As such, it does NOT include the proper fittings to supply fuel to the factory fuel filter bowl. We supply standard #6AN fittings for making the connection to the fuel inlet at the engine which will mate up perfectly with our 7.3L Fuel Bowl Delete Regulated Return Kit. * 03-07 6.0L NOTE : Although this kit was designed to work with our new "6.0L Fuel Bowl Delete" Regulated Return Kit, it is also possible to use it with our standard 6.0L Regulated Return Kit by connecting the outlet hose from this kit to the stock metal fuel supply line that runs from from the outlet of the stock fuel pump to the engine, and removing the stock fuel filter cartridge and standpipe assembly from the secondary fuel filter bowl. See the instructions for more detailed information. If you need to order replacement fuel filters for this kit, you can find them in the "Related Products" section below. 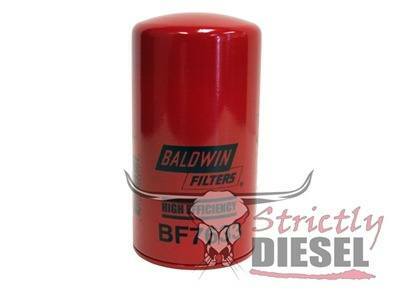 This kit uses the Baldwin BF1252 "Pre-Pump" Fuel Filter/Water Separator and the Baldwin BF7633 "Post Pump" Fuel Filter. 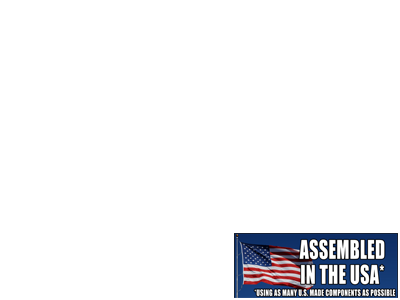 STOCK NOTICE : Due to the large number of options within our "Race Fuel Delivery System" line (Fuelab or Dual Bosch, Pickup or Sump, Battery Terminal Size), we do not have these kits pre-assembled and ready to ship. Each kit will be BUILT-TO-ORDER, once the order has been received. PLEASE ALLOW 3-5 BUSINESS DAYS FOR ORDER PROCESSING, KIT ASSEMBLY AND SHIPPING. If you have a need that is more urgent, please call our office and discuss it with a member of our staff to confirm that we can meet your deadline before ordering. Thank You for your patience and understanding! I have a 06 Ford F250 6.0 Powerstroke. Pros: Overall the product did exactly what I needed it to do. I was having issues with maintaining proper fuel pressure and the stock pump was getting expensive to continue to replace. The dual pumps supply plenty of flow and pressure to keep up with the demand I have with new injectors and Regulated Return kit installed. Cons. 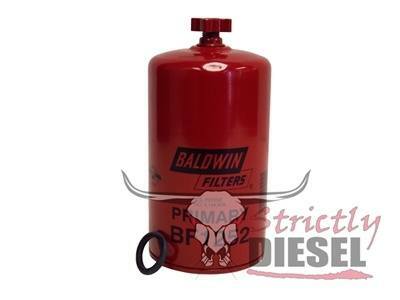 This product is to delete the stock pump from the fuel system entirely. Though this kit does NOT come with everything you need to do so. Based off the directions supplied, the return line ends up sending the fuel back through the stock pump, which normally is recirculated and pushed back out the pressure side of the pump but now no longer has hoses connected to the pressure side, and leaks fuel all over the ground. I called strictly diesel back looking for a fix, and they told me they have a fix for the issue, just not everyone knows about it yet and was planning on including the double male end connector for the return line to completely delete the stock pump from the system in the future. They charged me around 25 dollars for this part. Also, I am running a Airdog lift pump feeding the dual bosch pumps, you will need to come up with your own fix to run that set up. Also, unless you a very familiar of your set up, the directions do not have many pictures pointing everything out, so take your time reading the directions and grasping the whole concept on how to hook this system up. Overall, the professional quality of parts, and the possibility of expanding this kit is genius which is why I am giving this 4 stars. Because of the lack of parts to complete the full delete of the stock fuel pump (and charging me for the part to complete the kit) I can not give it 5 stars. Awesome setup. I wired the pumps separately and love having the option to alternate pumps or rum both for extra volume with my big injectors. 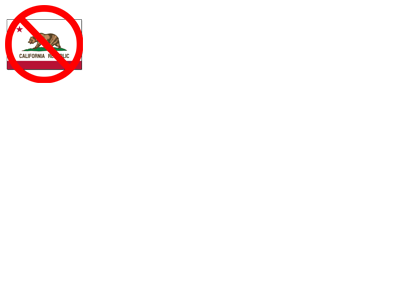 Easy to follow instructions. Highly recommend.